What might that look like? We spent some time exploring how companies could extend their existing apps for the Apple Watch, and what new types of applications could be available in the future. The Apple Watch is not like existing interfaces. Its potential lies in its limitations: It is accessible because it’s tiny and convenient because it’s only meant for seconds-long interactions. Features such as native voice control, haptic feedback, and a digital crown that can be used to magnify, scroll or zoom within apps crack open a whole new world of design requirements and opportunities (see more in sidebar). The smartest companies will do more than offer facsimiles of their existing apps; they’ll create custom experiences that exploit the watch’s unique interface. Last night on The Tonight Show starring Jimmy Fallon, Billy Joel joined the talk show host in a doo-wop video so entertaining that it was singled out by Tim Cook on Twitter. The featured iPad app is Loopy HD [Direct Link], which allows you to create music by layering loops that you record yourself. Fallon and Joel sang The Lion Sleeps Tonight, a song made popular in the 1960s by doo-wop group The Tokens. The pair sang different parts of the song in an amusing exchange that features a solo by Fallon and the always powerful vocals of Joel. Personally, right now, the first app I open in the morning is Twitter. But it hasn’t always been. A year ago, that app was Path. A year before that, that app was Instagram. Before that, it was probably Twitter again. Or Foursquare. Or Techmeme (technically, the web browser). At some point it was Facebook. And way back when it was probably — shudder — email. I’m not really sure why my instincts about which app to open first change over time. The best I can come up with is that it’s based on what my friends are using most frequently — or probably more importantly, in an interesting way. At a high level, I suppose it has to be the service I’m most addicted to. In a way, it seems analogous to the web browser homepage of yesteryear. Yes, web browsers still have homepages which you can set, but does anyone really care about that anymore? I feel like everyone I know now just automatically opens Google when they open their web browser — especially if they use Chrome which loads the Google Search bar for you. Or, perhaps more telling, no one seems to close their web browsers anymore, or restart their computers. So homepages matter less and less. Anyway, I see the first app you turn to in the morning as the new homepage. Some might argue it’s your entire homescreen of apps, but I don’t think that’s right. It’s the one service you care most about, no matter the reason, and want to load immediately upon hitting the web. The delivery device has changed, but the concept has not. Some days I rely on push notifications to tell me what app I should open first. But in an age of too many notifications, I usually just go right to Twitter, lest I be stressed out right when I awaken. I wonder what the next app will be which draws my immediate attention in the morning. Personally, that’s one of the strongest signals that an app is not only interesting, but vital. Those apps don’t always pan out, of course. But even catching that lightning in a bottle for a brief period of time is something more than most apps ever achieve. I wonder if there’s an app that can target just this use case? An app that aims to be your first stop in the morning, every morning. 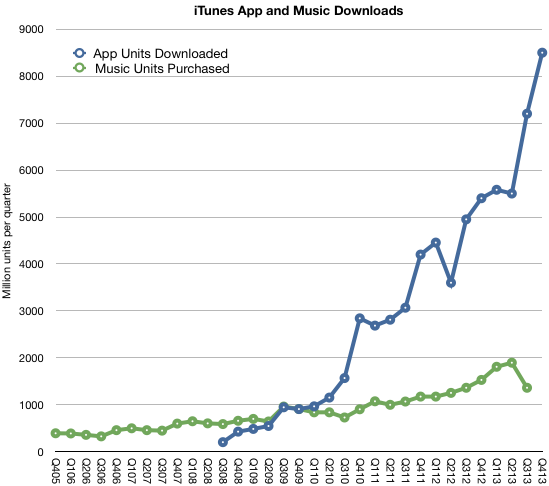 The App Store has now generated $6 billion for Apple and $15 billion for developers. 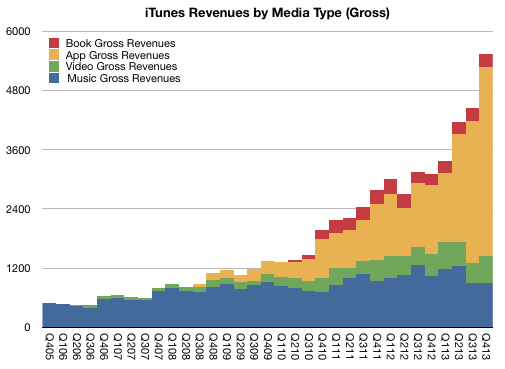 Apple app store payouts rocketing: $10 b (cumulative ) in June, $13b Oct, $15b Dec.
Media guys have it all wrong. It’s not digital pennies for analog dollars. Bits are big bucks, just not their bits. The following map shows the countries where iTunes Apps are available. It represents 123 countries. It also shows where the iPhone is currently available. The following map shows the countries where iTunes music can be purchased. The countries in white are countries where apps are available but music isn’t. There are 51 countries where you can buy music and 72 where you can buy apps but not music. The following map shows the countries where iTunes TV shows can be purchased. As in the previous chart, the countries in white are those where apps are available but TV shows aren’t. There are six countries where you can buy TV shows and 117 countries where you can buy apps but not music. Digital music (as iTunes defines it) started expanding outside the United States in 2004 and managed to reach these 50 other countries in seven years. TV shows took a much slower route. Not only has there been a limited selection of countries in six years of expansion but even the US, the programs available are a tiny subset of what is being produced. Is the TV business going to expand digital distribution at the glacial rate of music or not at all? In either case, the distribution of Apps as a digital medium is positively viral.